Due to market shortages, the cost of this drug has increased substantially. As supply catches up to demand, the price should decrease accordingly. USES: This medication is used to treat acne. It helps to decrease the number of acne lesions. 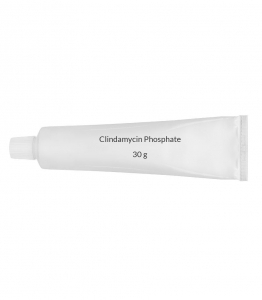 Clindamycin is an antibiotic which works by stopping the growth of bacteria. HOW TO USE: Use this medication only on the skin. Clean and dry the affected area first. Follow all directions on the product package, or use as directed by your doctor. If you are using the lotion, shake the bottle well before using. Apply a thin layer of medication usually twice a day or as directed by your doctor. If you are using the medicated pad or swab, apply to the the affected area gently with it, then discard. Depending on the size of the area to be treated, more than one pad or swab may be necessary. If you are using the foam, apply it once daily to the affected areas. Use enough to cover the entire affected area. Do not spray the foam directly onto your hands or face, because the foam will begin to melt on contact with warm skin. Instead spray the amount needed directly into the cap or onto a cool surface such as a counter top. If the can seems warm or the foam seems runny, run the can under cold water. Please read the patient information leaflet available from your pharmacist for specific instructions on how to use the foam, and ask about any information that is unclear. Wash your hands after use. Avoid contact with your eyes, nose, mouth or any areas of broken skin. If you accidentally get medication in these areas, rinse well with plenty of cool water. It may take between 2-6 weeks to notice an improvement in your condition, and up to 12 weeks to see the full benefit. Inform your doctor if your condition does not improve or worsens. SIDE EFFECTS: Burning, itching, dryness, redness, oily skin or skin peeling may occur. If any of these effects persist or worsen, notify your doctor or pharmacist promptly. Remember that your doctor has prescribed this medication because he or she has judged that the benefit to you is greater than the risk of side effects. Many people using this medication do not have serious side effects. A small amount of this medication may be absorbed into your bloodstream and may rarely cause a severe intestinal condition (Clostridium difficile-associated diarrhea) due to a resistant bacteria. This condition may occur while receiving treatment or even weeks to months after treatment has stopped. Do not use anti-diarrhea products or narcotic pain medications if you have the following symptoms because these products may make them worse. Tell your doctor right away if you develop persistent diarrhea, abdominal or stomach pain/cramping, or blood/mucus in your stool. A very serious allergic reaction to this drug is unlikely, but seek immediate medical attention if it occurs. Symptoms of a serious allergic reaction may include: rash, itching/swelling (especially of the face/tongue/throat), severe dizziness, trouble breathing. This is not a complete list of possible side effects. If you notice other effects not listed above, contact your doctor or pharmacist. In the US - Call your doctor for medical advice about side effects. You may report side effects to FDA at 1-800-FDA-1088 or at www.fda.gov/medwatch. In Canada - Call your doctor for medical advice about side effects. You may report side effects to Health Canada at 1-866-234-2345. PRECAUTIONS: Before using clindamycin, tell your doctor or pharmacist if you are allergic to it; or to lincomycin; or if you have any other allergies. This product may contain inactive ingredients, which can cause allergic reactions or other problems. Talk to your pharmacist for more details. Before using this medication, tell your doctor or pharmacist your medical history, especially of: chronic asthma or hay fever (atopic conditions), intestinal diseases (such as ulcerative colitis, enteritis, Clostridium difficile-associated diarrhea). Tell your doctor if you are pregnant before using this medication. It is not known if the medication in this product passes into breast milk. While there have been no reports of harm to nursing infants, consult your doctor before breast-feeding. DRUG INTERACTIONS: Drug interactions may change how your medications work or increase your risk for serious side effects. This document does not contain all possible drug interactions. Keep a list of all the products you use (including prescription/nonprescription drugs and herbal products) and share it with your doctor and pharmacist. Do not start, stop, or change the dosage of any medicines without your doctor\'s approval. Some products that may interact with this drug include: other acne skin treatments (such as erythromycin). STORAGE: Storage instructions vary depending on the product. Check the product package for instructions on how to store your product, or ask your pharmacist. Do not freeze or store in the bathroom. Keep all medicines away from children and pets. Do not flush medications down the toilet or pour them into a drain unless instructed to do so. Properly discard this product when it is expired or no longer needed. Consult your pharmacist or local waste disposal company. Information last revised February 2016. Copyright(c) 2016 First Databank, Inc.